This group exists to help establish a mobile ministry movement so that within ten years every unreached person will have had a chance to encounter Christ and His kingdom in a compelling, contextualized fashion through their personal mobile device. In order to access the links embedded in each discussion, you must open each discussion by selecting it. By clicking on the links as they appear on this page, the link may not resolve properly. Click View All to see all of the discussions. From this page you can search and sort the discussions as needed. Started by Allan Lee. Last reply by Jim Zarbaugh Apr 22, 2014. Started by David Olson Mar 6, 2013. Started by Keith Williams Feb 19, 2013. Started by Keith Williams Feb 7, 2013. Started by Jim Zarbaugh. Last reply by Jim Zarbaugh Aug 26, 2012. Started by James Thomas. Last reply by James Thomas Aug 15, 2012. Started by J. R. Whitby. Last reply by Bryan Gough Jul 24, 2012. Once we have made it easy for people to access content via mobile media, how do we then help them engage with the content and make them hungry for more? Started by James Thomas. Last reply by Antoine RJ Wright Jul 7, 2012. Started by Keith Williams. Last reply by Clyde Taber May 17, 2012. Started by Paul Weaver. Last reply by James Thomas May 13, 2012. Thanks Antoine for the link to "The Digital Divide in Numbers". Amazing stuff and a powerful reminder that if we are going to reach the nations for God's glory we need to be thinking mobile. Here's part of the findings "But in Africa, Latin America, the Middle East and the Developing parts of Asia, mobile is alone, far far bigger than any other. There are nine times more mobile phone accounts than cars. There are seven times more mobile phones than personal computers, nine times more mobile phone accounts than home or office PCs that are connected to the internet. There are seven times more mobile phone accounts than fixed landline telephone connections, and five times more mobile phone users than total number of TV sets in use. Even radio, there are 2.5 times more mobile phone subscribers than all FM radios in use in the Developing World." I love that quote from Digital Divide in Numbers! Thanks for pulling out that section, K.
If anyone's wanting to explore Google Wave, I have invites to issue. Interestingly, GW has a version it auto creates for mobiles to access it - still in early version but functional. 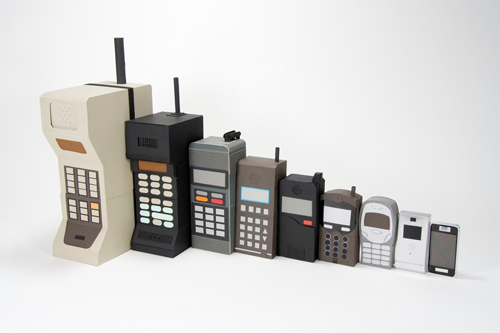 Now here's a cute mobile art project: A nesting doll shows the evolution of mobile phones from the Motorola DynaTAC 8000X to the Apple iPhone. Great photo Dave! Have some friends that are still in the second from the right category. You need to be a member of Mobile Media Ministry to add comments!